In this feature, The Log looks at notable boats — sail and power — that continue to turn heads in Southern California harbors. The Back Story: Zapata II, designed with speed in mind for racing by Wendell “Skip” Calkins, was custom built in 1964 out of mahogany and oak by American Marine in Hong Kong. This classic sailing yacht has always been in the hands of Southern California owners. Zapata II’s previous owners of 35 years, Jim and Marion Jordan, were diligent in preserving her. She was docked at the Jordan’s residence in Newport Beach “glowing in the setting sun” when her current owners saw her for the first time. Sage and Kelly Marie of San Pedro had different ideas of what they wanted in a boat. Kelly Marie desired a modern boat with certain amenities to get the most out of weekends spent in Catalina Island, according to Sage Marie. Sage Marie desired a classic vessel but worried about the upkeep required for an older boat. “I’ve always had a strong affection for classic boats because of their beauty, warmth, character, charm and uniqueness,” Sage Marie said. Sage Marie noticed Zapata II in a listing for sale. He was in awe of Zapata II, but it wasn’t until he was at a boat show with Kelly Marie when he noticed her admiring a “big old steel-hulled center cockpit ketch.” It was then he decided to show Kelly Marie this classic boat. The very next day, the Maries went to the Jordan’s residence to view Zapata II. The Maries immediately fell in love with her refined yet sleek lines and her remarkable condition. “We were both instantly ‘boat struck.’ It was love at first sight. 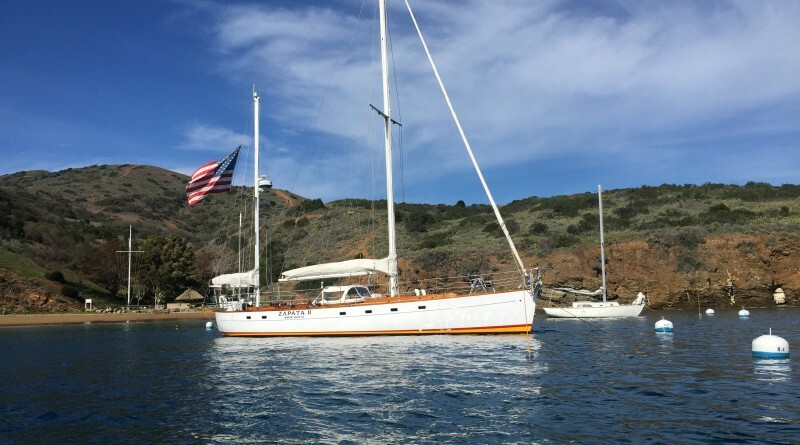 [Zapata II’s] beauty and charm won Kelly over, and the boat was in such perfect shape that it helped ease my concerns over maintenance,” Sage Marie stated. The Maries purchased Zapata II in 2015 and joined the Los Angeles Yacht Club (LAYC). They now appreciate sailing to Howland’s Landing, LAYC’s cove in Catalina Island and participating in various regattas. “We also enjoy taking her to boat shows, where it seems like there’s constant procession of local sailors and classic boat enthusiasts who have had some sort of experience or interaction with Zapata over the years,” Sage Marie stated. They are directing their efforts on maintenance and upkeep, so there are no restoration plans at the moment for this 53-year old yacht. The Name: Zapata II was named after the Mexican revolutionary leader, Emiliano Zapata. “At times I feel like the boat is leading a revolution against us,” Sage Marie said. The Berth: Holiday Harbor, San Pedro.